Honor Someone Special With a Heartfelt Donation. 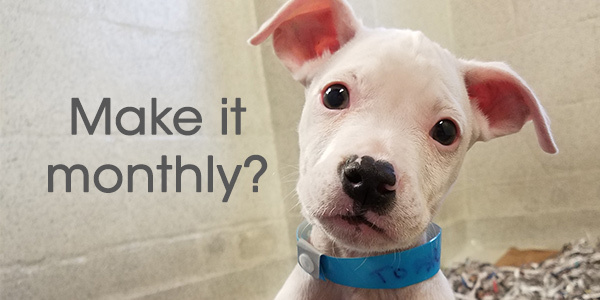 Whether it be a pet, friend, teacher or family member, what better way to honor someone special than with a donation to the Atlanta Humane Society. It's a special way to say Thank You, Happy Birthday, or celebrate any occasion. Your donation is a touching honor that helps the animals at AHS, enabling us to care for them and find them loving homes. 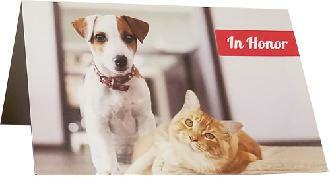 We will send the person you honor a printed card or an eCard to let them know of your generous contribution. Your Honorary gift truly keeps on giving and provides a meaningful way to honor someone special in your life. To make a gift by mail, send your check made out to Atlanta Humane Society to Honor Gifts, 981 Howell Mill Road NW, Atlanta, GA 30318. Download the printable Honorary Donation form here. To make a gift by phone call 404 974-2895. Cat and dog artwork by Daniel Ratner, in memory of his father, Jonathan Ratner. Please complete the fields below with the address of the person who you wish to receive the mailed card (usually the honoree). Please allow five business days for processing.